At Clean Planet, we understand that your time is precious. Spending time with family, friends or on your own personal pursuits is where you want to invest your time. Our job at Clean Planet is to free up your time, increasing your time for enjoyment and relaxation. Whilst you are away from home, our team make it sparkle, ensuring it is spotless when you return to your haven. If you have any queries, please get in touch with our Home Cleaning Manager. Why Our Clients Choose Clean Planet? A regular weekly or fortnightly maintenance clean to keep on top of the day to day cleaning and leave your house sparkling. A full deep clean from top to bottom to ready the house for the next occupants. A Spring Clean or Deep Clean to clean all nooks and crannies for houses that may not have been fully cleaned for some time, or to get the house ready for a special event. We believe in creating healthier homes and workplaces. Healthy homes are happier and less stressful, and healthy workplaces are more productive. We want to help our clients improve the health of their home or work environment, reduce family and staff sick days and improve their wellbeing and business bottom line. "The cleaners did a fantastic job"
"Great team, they worked very well together"
"[Kunal] was fantastic and did an awesome job!" I just wanted to say thank you for working your magic on our house today. Your work is so much appreciated by me and the whole family. SIMPLY AMAZING CLEANING JOB DONE FOR OUR PROPERTY & AIRB&B SERVICE. THE HAPPY THING IS THAT WE REDUCE OUR IMPACT TO THE ENVIRONMENT. All looked superb - thank you. It was a treat to come home all tired after our company physically demanding day out, to a clean home. Thanks so much for being so accommodating. I am so pleased with the result too. The team you sent did an awesome job and were friendly and professional. We are busy working family with kids going to school all day. My partner and I have a 4 - bedroom house and it takes a lot of effort to clean regularly. I would like to come back from work to a clean and healthy home, so the best way is to have Clean Planet Team to come over and do a weekly clean on Friday mornings. They did a brilliant job and I can save time working on the things we love (We love the sea). 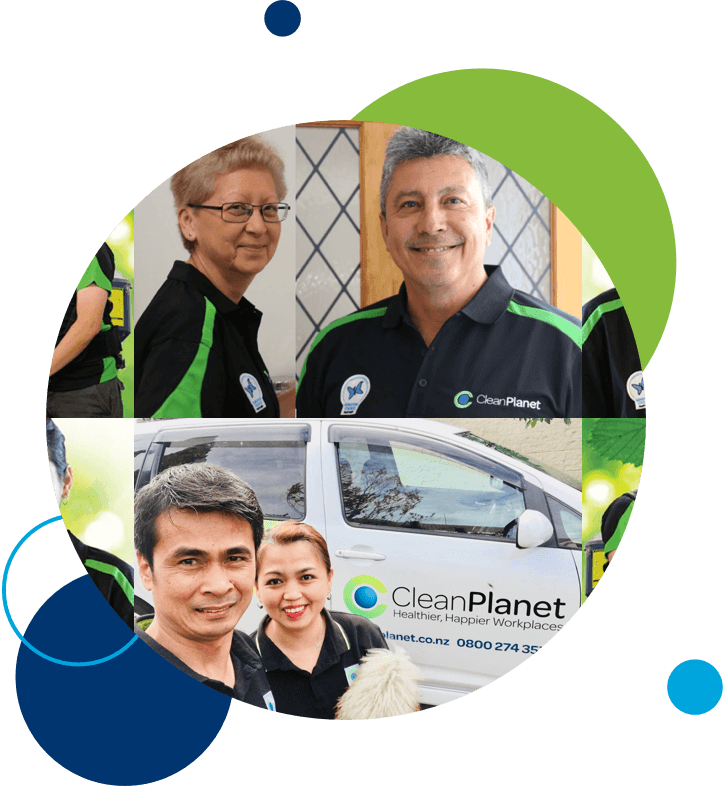 I have the team at Clean Planet to come over and do regular clean, that is the best way to save time and organise a big family while maintaining a full time job. Love the work they have done. Very professional. 1. Clean Planet is only Cleaning company in New Zealand approved as an Asthma & Respiratory Foundation Sensitive Choice® partner. 3. Clean Planet was the first Commercial Cleaning company in New Zealand to cease using harsh chemicals in clients' premises. How is Clean Planet healthier for my home? Clean Planet is the only Asthma & Respiratory Foundation of NZ's Sensitive Choice® approved cleaners. We formulated and manufacture our range of health-focused, environmentally kinder products locally. Our products do not contain chemical culprits such as bleaches, disinfectants, chloride based cleaners, EDTA, dyes and phosphates, and we significantly limit the use of Volatile Organic Compounds [VOC’s]. We’ve also fine-tuned all our cleaning processes to improve indoor air quality and create a healthier home or work environment. What is the Sensitive Choice® programme? Sensitive Choice® is a community service focused programme set up by the Asthma & Respiratory Foundation of NZ for all who want to breathe purer, cleaner, fresher air and reduce allergic reactions. While the Sensitive Choice approved products and services do not claim to offer cures or treatment for conditions, we conscientiously work to help cleanse and purify the personal environments in which we all live and breathe. Can anyone be a Sensitive Choice® partner? No! Any company wanting to join the programme must have their products or services undergo rigorous examination by a panel of Health and Science professionals before being approved. Does Clean Planet follow sustainable / environmentally-kinder cleaning practices? Clean Planet cleaners get full theory and proactical in-house training to NZQA standard. They then get put alongside an existing cleaning team in a 'buddy' training system before being able to clean by themselves. Results are regularly monitored via spot checks, their star-rating and customer feedback. Give Clean Planet and your cleaners feedback! Tell us what you like, or what could be improved. Either use the star-rating system, contact your cleaners directly, contact Clean Planet on 0800 274 355, or see 'Contact' details on website. What do I need to do if I want [not need] to change my cleaning schedule?